Over ten activists, three MPs and several journalists were been seriously injured after Berkut riot police used force outside Kyiv Sviatoshynsky district court and Sviatoshynsky district police department of police, MP from Svoboda faction Yuriy Syrotiuk told Interfax-Ukraine. "Three MPs were injured: Eduard Leonov, Yuriy Bublyk and Pavlo Kyrylenko [all three from Svoboda faction], who were in Kyiv Sviatoshynsky court," he told the agency on Saturday. He said protesters were outraged by the verdict passed by Kyiv Sviatoshynsky district court, which sentenced three men each to six years in prison for planning to blow up the monument to Lenin in Boryspil in 2011, and started the rally. As a result of the clash with police, people received fractures to their hands and legs, traumatic brain injuries, and some lost consciousness. Moreover, Berkut fighters threw part of a forged grate onto the legs of one of the activists, Syrotiuk said. According to him, the situation outside the court building was similar to the clashes on Bankova Street on December 1, 2013, but this time there were fewer police and injured people. The MP said the Berkut police violated official instructions – they hit people's heads. "The demand was simple: the Berkut had to take off their masks and show their faces," he said. Syrotiuk said the incident had been planned by the authorities, who "deliberately wanted the participants of Euromaidan and Avtomaidan to come there and start to beat law enforcers. He noted that leader of the Third Ukrainian Republic Yuriy Lutsenko was beaten during the clash. Some journalists and cameramen were also injured. 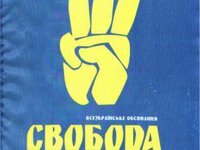 Leader of Kyiv organization of Svoboda Union Andriy Ilyenko, in turn, said that they achieved the goal and Berkut fighters showed their faces. They were photographed and soon they will be punished, the organization's press service quotes MP as saying.